The Mozzarella di Bufala‘s package must show the Consorzio di Tutela Mozzarella di Bufala Campana and the PDO (DOP – Denominazione di Origine Protetta) trademarks. The label P.D.O. refers to the region and production area of a specific cheese, whose characteristics are strictly related to a geographic area, the only place where it can be produced. All P.D.O. products are subject to a set of traditional codified rules within the framework of a detailed production procedure provided by the European Commission. This procedure establishes the product’s characteristics, ranging from production techniques to labelling and marketing rules. 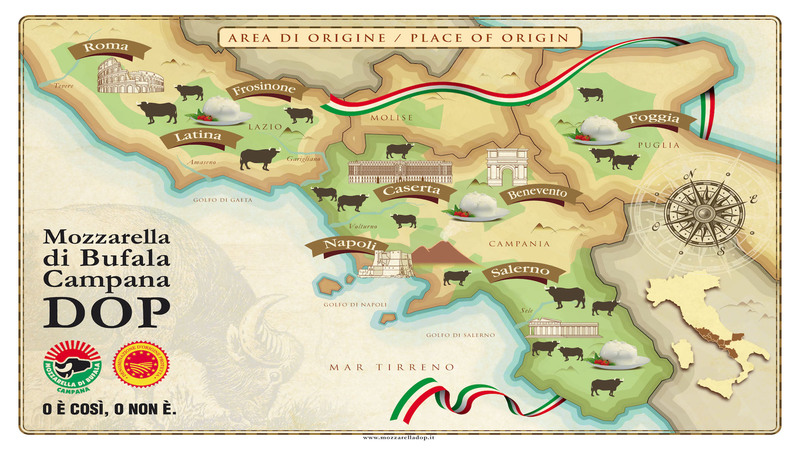 The Consorzio di Tutela della Mozzarella di Bufala Campana, born in 1981, teams up more than 300 enterprises and is the sole organization appointed by the Italian Ministry of Agricultural to protect, survey and promote this cheese. In addition to all official controls, the Consorzio di Tutela carries out routine inspections in both production facilities and sales outlets. It provides as well technical assistance to both producers and breeders, performs activities designed to inform consumers about the product and promotes this cheese in Italy and abroad.